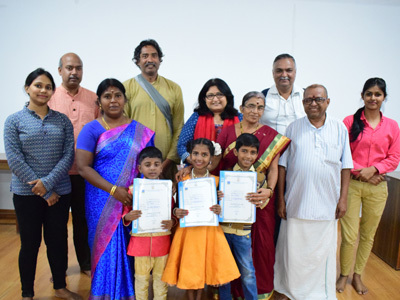 Sri Aurobindo Foundation for Indian Culture (SAFIC), a unit of Sri Aurobindo Society, Puducherry, is dedicated to the propagation of Sanskrit language through its various projects and activities undertaken on several forums. Samskrita Bālaparivāra Yojana, one of the projects undertaken by Samskrita Bālasāhitya Parishad, is an innovative programme designed by SAFIC dedicated to making Sanskrit learning fun and creative for children. Under this programme, Sanskrit is taught to pre-primary and primary grade level children through a variety of fun games and activities, verses of practical wisdom, rhyming songs, simple and inspiring stories, conversation, shlokas, arts, hymns and various other creative activities. The programme is run via an equally innovative delivery model. Teaching and learning take place at especially organized Children’s Sanskrit centres, which are managed and run by specifically trained teachers. Each centre is managed entirely by one dedicated, trained teacher. These centres may be organized at a neighbourhood school, teacher’s home, or any other appropriate place to be identified by the teacher. Students of pre-primary group (ages 4–6 years; grades Nursery to First) and primary group (ages 7–10; grades Second to Fifth) are enrolled in separate batches. Each centre offers two 8-month-long courses – one for pre-primary batch and the other for primary batch. The course is divided into two semesters – January to April and July to October. 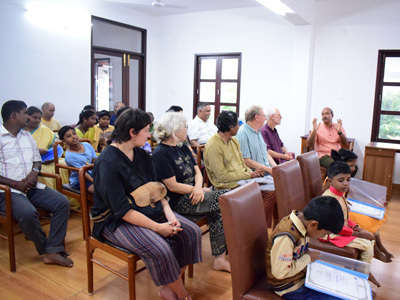 Our first Children’s Sanskrit centre is currently being administered at the Society House (Beach Office) of Sri Aurobindo Society, Puducherry, on Saturdays (from 4 to 6 pm). At present three students, ages 6–9, are enrolled at the centre. These students attend three different schools in Puducherry and come to the centre every Saturday for their Sanskrit class. The class is run by Ms. R. Rajakumari (teacher–coordinator, Samskrita Bālaparivāra Yojana and Sanskrit teacher at SAFIC). On December 15, 2018, the students – Aravind, Monisha and Varun (the latter two being siblings) – gave their first end-of-semester presentation at a specially organized programme at the Beach Office. The children came dressed in their colourful dresses, ready to enthral the audience with their performances. The programme started at 5:00 pm with a small welcome message by Ms. Rajakumari, followed by a small invocation to Lord Ganesha, presented in Sanskrit by the three students. Speaking in a combination of Tamil, Sanskrit and English, Rajakumari-ji then gave a small introduction about Samskrita Bālaparivāra Yojana, and the innovative teaching approach being followed at the Children’s Sanskrit centre. 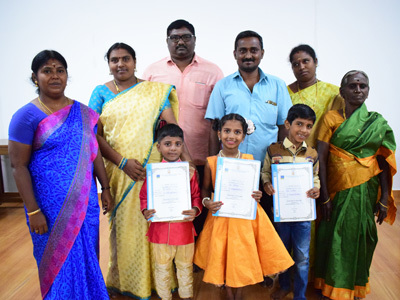 She also introduced the students who had successfully completed their first semester and spoke about the enthusiasm with which children come for their classes and the fun they have learning stories, songs and rhymes. She then invited Mr. Vishwanathan (a Sanskrit enthusiast and Volunteer at SAFIC) to speak a few words about Sanskrit language and its significance. Vishwanathan-ji spoke of the link between Sanskrit and ‘Sanskriti’ (culture), and how Sanskrit language by its intrinsic nature means ‘refined to perfection’. He also briefly talked about the importance of propagating Sanskrit learning among children who will shape the future of India, and commended the efforts of SAFIC and Samskrita Bālaparivāra Yojana in this direction. 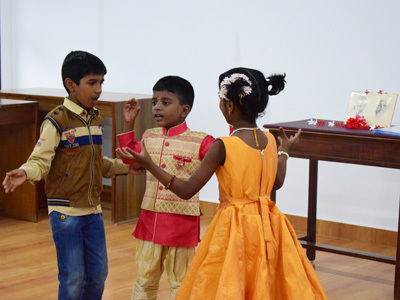 It was now children’s turn to give their performances and share with the audience some of the fun things they had been learning in their Saturday Sanskrit classes. First, six-year-old Varun gave a short performance, confidently recounting the Sanskrit words for different parts of the body, by pointing to the part. Next, Monisha recited a few shlokas; her demeanour and poise were just as calming as her chanting. This was followed by a vibrant story-telling session by Aravind. The nature of these performances and the enthusiastic delivery by each of the children suggested the rich variety of methods used for making Sanskrit learning fun and creative. The final piece was a group performance in which all three children sang a song about a sparrow. The audience, which included the parents of the children, members of SAFIC team (including the three young trainees who are currently undergoing training at SAFIC for their future work as teacher–coordinators for future centres to be opened under the Samskrita Bālaparivāra Yojana), and other members and employees of Sri Aurobindo Society, fully enjoyed all the performances and encouraged the children with big applause. Rajakumari-ji then invited the parents of the children to give some feedback on their children’s experience attending the Sanskrit classes. Varun and Monisha’s father shared that it has been a joy for him to watch his children learn Sanskrit. He felt it was important for children to know Sanskrit because it is a key to the great wisdom, knowledge and traditions of India, including all kinds of literature in fields such as medicine, science and mathematics. 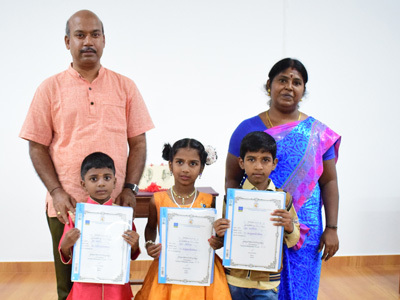 He expressed his thanks to SAFIC and Sri Aurobindo Society for organizing such programmes to facilitate children’s learning of Sanskrit in such creative ways. He said he would definitely want his children to continue learning Sanskrit because they are highly enthusiastic about it and look forward to the Saturday class. This was followed by the Certificate distribution for the children who received them as a blessing from the Mother. Dr. Sampadananda Mishra, Director, SAFIC, said a few closing words expressing SAFIC’s hope and dream to reach lakhs of children through expanding Samskrita Bālaparivāra Yojana in the coming years. The programme ended with lots of good cheer all around and photo sessions of children with their families, their Sanskrit teacher and the entire SAFIC team. The second semester for this first batch of students will start from January 2019.